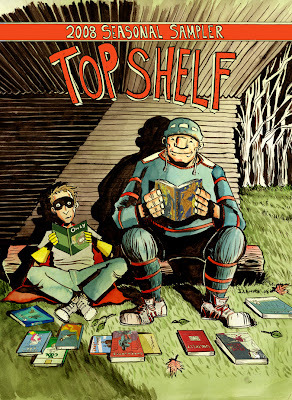 Here is the recent cover art I did for Top Shelf's 2008 Seasonal Sampler. The Sampler will probably be shipped in the spring/early summer and is a great free trade paperback-sized volume featuring tonnes of artwork and previews of upcoming books by myself, James Kolchaka, Nate Powell and a bunch of other great cartoonists, as well as perrenial Top Shelf favorites. So be sure to ask your local comic shops for one.